The End of the Alphabet By C.S. Richardson Ambrose Zephyr is an Englishman, nearing 50. He is simple, he is kind and he is madly in love with his wife Zipper. All seems well until one day the doctor alerts him of an illness and he is told he has one month to live. What would you do? What would anyone do? Ambrose and Zipper, who abruptly takes leave from her job, venture on a journey to travel to places loved or always had dreams of visiting, from A to Z. Amsterdam to Zanzibar. Together they try to keep their love alive and enjoy each moment together. This kind of information makes everything else so trivial. Our daily worries, burdens and concerns seem frivolous if we knew we would not be here in a month. This small novel takes us inside their hearts and minds. It is a most unique story that mesmerized me in a quirky, not necessarily sad way. "A" is for adorable!!! 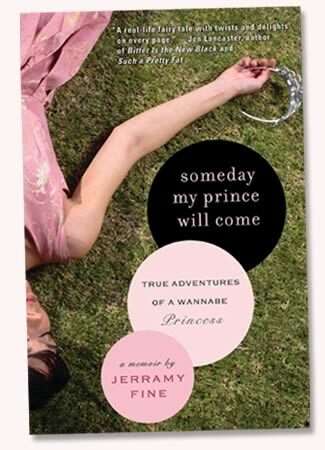 This first book by Jerramy Fine (yes, she knows that Jerramy is a boys name!) was an absolute pleasure to read. Like taking a little vacation into her world for a few days. Jerramy has dreamed her entire life of living in England. She is madly in love with Peter Phillips, son of Princess Anne (his grandmother is the Queen). As Jerramy grows up with "hippie" parents in a small town in Colorado she dreams of the day she can finally escape to fulfill her true destiny which, as she sees it, should be as a real life princess. She completes a semester in London and after college decides to get a masters at London School of Economics. Jerramy takes the reader on all her adventures. She shares her accomplishments, and her heartaches. Every girl dreams of finding their soul mate, other half, prince charming. She can find romance in a smile. She meets dozens of fun loving interesting characters along the way and magically always lands on her feet. (These are the adventures you look back on 20 years later and are glad you somehow survived) As I read and reminisced about my college adventures abroad (and love interest at the time!) I cannot help but smile, laugh out loud and cheer for this charming girl that wants it all and believes, truly believes there is no reason she cannot find her dreams come true. (me too!) I remember that carefree life as if it was yesterday. Where did that girl go? I highly recommend this book if you are in the mood to kick back relax and have a great time. 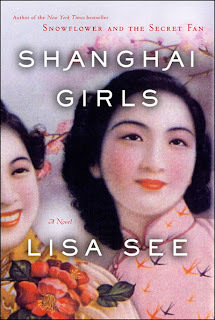 Shanghai Girls By Lisa See. Pearl and May Chin are sisters in Shanghai in the late 1930's. They are beautiful, educated, modern girls having the time of their lives. Romance is blooming for the first time in their lives. Sadly, their father loses all his wealth gambling. In conjunction with political problems brewing, their father feels he has no other choice but to settle his debt by selling the girls into marriage with businessmen from Los Angelos. The girls are shocked, scared and helpless as they can see no other way out. Trying hard to make the best of it, they travel to California and attempt to adjust. New husbands, a love that does not exist, language barriers, new culture and the lights of Hollywood. The sisters ensue a love/hate relationship filled with jealousy and loyalty at the same time. Their lives are completely intertwined as they struggle to find happiness and create family of their own in this new land. As this story evolves the reader is immersed in the detail that Lisa See vividly describes through their triumphs and failures. Easy read, enjoyable, cannot compare to Snowflower, although probably nothing can. Aminata Diallo is born in Bayo, Africa. It is the late 1700's when she is stolen from her village, taken away from her family and everything she knows by slave traders. She is 11 years old, afraid and alone. Aminata survives a horrendous ocean crossing to the colonies. She is auctioned as a slave to an indigo plantation. The first friend she makes is Georgia who nurses her back to good health and takes her under her wing. Aminata helped her mid wife mother catch babies and now helps Georgia. Another slave that is in charge secretly teaches her to read and write and this dramatically changes her life. She moves on to other towns and eventually escapes to live on her own. Being educated makes Aminata unique. Her compassion and love brings her many friendships and relationships that are both surprising and heartfelt. Her journey through her life is astounding. The people places and events she survives make this novel one you cannot put down. The reader is brought deep into Aminata's life and this is a book you are sad to finish. It isn't often I find a story so touching and a character I can connect with that lived hundreds of years ago. Ah ..... if this was a movie (and I would bet that it will be) I think Aminata could be played by Queen Latifah. I say this because I think of her in Secret Life of Bees and find her to easily fit into this smart strong loving female role. I am very open minded. There are good books that I tell people about. There are ones I don't. There are great books that I cannot put down and spend every waking moment reading. Then there is this mediocre category that has no name when you are waiting for something to happen, anything, pleeeeeease! My book club met yesterday and discussed this book. We are in agreement that the hype did not match our experience. On the positive side we were able to have a discussion. Unfortunately, most of the talk was about how boring the story and the writing were. I love the idea of friendships lasting forever. I completely agree that the girls you grow up with know you in a way that noone else does. I have attended 3 highschool reunions and enjoyed them immensely. I have a handful of friends I grew up with that are deeply embedded in my heart and will be forever, regardless of how often we see each other. I get it! BUT ... this book was all over the place. Too many names. Too many dates. I connected with not a single character. None of them led terribly interesting lives. My entire club struggled to finish. Sorry girls from Ames. I am sure you are all very nice but this book just didn't cut it. How these types of books make it to the best seller list, I will never understand. Power of the media and marketing, I guess. Thanks anyway. Can't cast a movie, I would sleep through it. 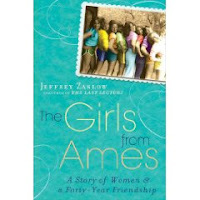 I have an affinity to stories about Africa (see list on blog for additional suggestions! ), especially about people from other places settling there. 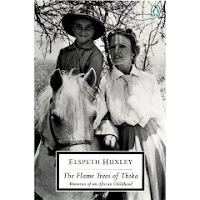 This memoir tells the story of a family in 1907, living in England. They decide to move to Africa and start a coffee plantation/farm. They have little or no knowlege or experience with either of these two businesses. It amazes me that without a glance back a family would make a move this extraordinary. They arrive with a mere curiosity and interest but their love of the land and people grows intensely and it undoubtedly becomes their home. They live in grass huts with furniture they have brought with them to Africa. They manage to find and make foods that are palatable. They read any material they can lay their hands on to assist them with their new endeavors. They admit there is not much written about this area at this time. Their money is limited, they have a young daughter that they attempt to home school. Who does this sort of thing???? Do people still have this sense of adventure? They are not alone. A handful of Europeansand Austrailians become their neighbors. All quirky characters, one more nuts than the next. The author was the young girl in the story. Through her eyes we see Africa. We feel Africa and sometimes we can smell it! She is wonderful at detailing her story sometimes with the great emotion of a child and then as an adult trying to understand what the adults in her life were accomplishing and struggling with. Thoroughly enjoyed this classic. Can't cast this movie because although I have not seen it, I am told there is a mini series!